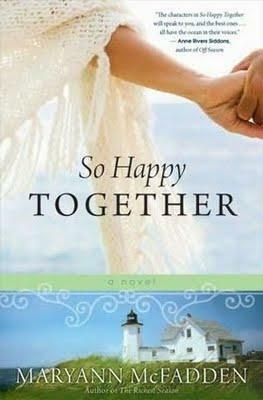 So Happy Together is Maryann McFadden’s second novel in which the themes of love, change, and nature—along with a strong and very human woman protagonist—are at the heart. Claire Noble is a forty-five-year-old woman in the “sandwich” generation; she has to juggle living her own life while caring for her daughter, as well as her aging parents. As the book begins, Claire is planning her new life with her fiancé Rick, who loves golf nearly as much as he loves an easy and uncomplicated life. But Claire’s life is anything but uncomplicated. Her daughter, to whom she hasn’t spoken in months, abruptly returns home and has a baby. Claire’s father is diagnosed with Parkinson’s disease. An environmental writer moves into the area and asks Claire to take the photos for his upcoming article. The beautifully planned life she and Rick used to have becomes very messy very quickly, and all that Claire thought she wanted, all she thought she was, comes into question. The book is set in New Jersey and Cape Cod. McFadden writes beautiful descriptions of both areas, and there is a strong emphasis on embracing nature and family. There is also a strong focus on images, which makes sense considering Claire is a photographer, and the culminating scene takes place at her art show. I wholeheartedly applaud the telling of the story of a woman in Claire’s position, and I also appreciated the story being told, at times, from the perspective of Claire’s mother. The lives and challenges of middle aged and elderly women aren’t often represented in today’s fiction world. The women in _So Happy Together _have a pocket of emptiness in their lives, and we get to see them fill in those pockets as the book goes on. While the book has a fairly interesting plot and characters that are generally believable, the book tries to do just a bit too much. The layers of stress and trauma from side characters get to be overwhelming, and at times, the writing suffers. The effort to show the real complexities of the world is admirable, but it gets too heavy handed in places. That being said, I love McFadden's (mostly) subtle agenda of protecting the environment and raising awareness about the beauty and magic in the natural world. Inherently, the book rejects cookie cutter suburbia and development, and this is a lovely addition to the text. So Happy Together is a decent followup to The Richest Season. It is not a step up in quality, but it is certainly not a step down.